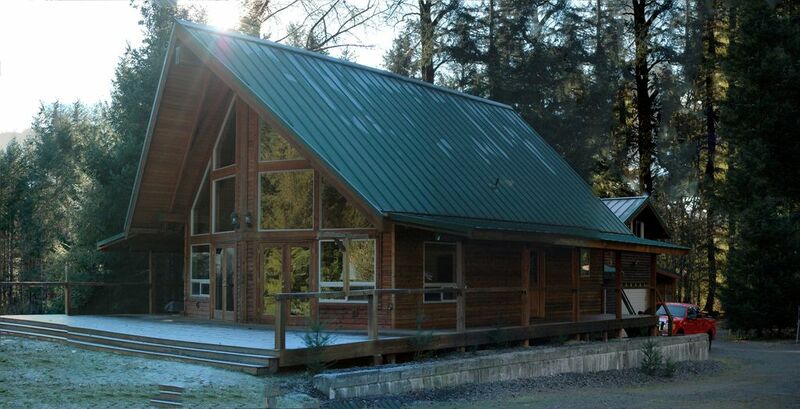 Majestic Mountains, Tall trees, Rushing water, a roaring fire and wildlife surround you! All of the comforts of home and then some! High Speed Internet, New Digital TV, BluRay DVD, Air Conditioning, new Furnishings, new bedding and linens, fully stocked kitchen with a dishwasher, microwave and full sized stove; laundry room with full size washer and dryer. Game House with Ping Pong, Air Hockey and Foos Ball. A brand new 6 person hot tub. All guests have access to High Valley Country Club swimming pools ($5 fee per person) and golf course ($10 fee per person). 1. This is a non smoking property. Smoking is not allowed inside or within 15 feet of the house. 2. This is a NO PETS property. 3. No one under the age of 25 is permitted to rent the cabin. 4. A $300. refundable security deposit is required for the cabin. Report any damage immediately to the Owners upon entry of the premises. Tenant acknowledges that he/she may be charged for damages not reported at the beginning of the rental period. An inventory and damage report is taken upon the completion of each rental period. Damage includes, and is not limited to, wear and tear beyond normal usage, such as damage to walls, fixtures, glass, decks, landscaping, carpets, structures, lost, damaged, or destroyed linens, electronic components and appliances. 5. Access instructions will be emailed prior to your arrival. Check-in time is 3:00 p.m.(PST). Check-out time is 11:00 a.m.(PST). 6. Neighbors: Tenant agrees to respect the rights and privacy requirements of our neighbors. No loud music or parties are allowed on the these premises. The use of fireworks are strictly prohibited on premises. Be considerate with cars and noise coming and going at early or late hours. There is a local quiet time ordinance . If you are disruptive to our neighborhood you may be evicted without a refund. 7. Evidence of cigarette smoke-$200 charge. 8. We are not liable for failures of any equipment, systems, or appliances, as major repair problems cannot be foreseen. In the event of a failure notify us immediately as we may be able to get it fixed/replaced quickly. 9. If the Tenant or any member of his party violates any of the terms of this agreement, Owner may terminate this lease with no refund and enter the premises to remove the tenant, his party and their belongings according to the Vacation Rental Act. 10. Renter and all members of his/her party agree to indemnify and save the Owner harmless from all liability, loss or damage arising from any nuisance or harm made or suffered on the premises and adjoining property by the Renter, his/her party of their invitees, from known or unknown danger or hazard attributed to the Owners. Including the HOT TUB and BUTTER CREEK. 11. The maximum number of people that can occupy the cabin is 10, (unless other arrangements were made). Occupy means overnight sleepers and daytime visitors. $25 per person/night is charged for unauthorized guests. Violation of this agreement is cause for immediate eviction. By completing this rental, RENTER CERTIFIES that he/she is a responsible adult over age 25 and will be one of the occupants. I have read, understand, and agree to the rental terms & regulations as stated above. During this rental, I am solely responsible for all damages. Hello, my name is Maximillia. I LOVE to TRAVEL, can't think of something more exciting than going somewhere that I've never been. I love the mountains, the beach, and cities too, the Hawaiian and Greek Islands are my current favs. I love NYC and Washington DC for touring, and think the Pacific Coastline (HWY 1) is breathtaking! I never tire of driving and exploring it, from the Redwoods down to Big Sur and LA I am a lifelong bookworm and absolutely cannot resist a pair of killer heels. My hobbies are interior and landscape design, creating beautiful places for people to enjoy. Entertaining is a big part of my life; food, fellowship and fun with people I love. We bought this property because we fell in love with the rushing water of ButterCreek and the beautiful mountains surrounding it. The proximity to White Pass with all the comforts of home! Chez Maximillia we love you! It was amazing! The house was absolutely beautiful in every way. The children had so much to do. I totally think it’s a great place for families... the elk even visited on the last day!! This home was such a lovely place to spend the weekend! Very close to Packwood town center so we were not far from fuel and the small grocery store. It was also a very quick trip up to White Pass for a day of skiing! Aside from location the home itself was immaculate with plenty of room for 6 adults to comfortably relax. Plenty of books and movies and places to sit and chat or play games. The hot tub was a wonderful respite from the cold and cure for the soreness of skiing all day. Kitchen was well stocked with plenty of spices and utensils for cooking a meal. Will definitely be going back. Stunning cabin with a gorgeous view of the creek and mountains! Everything about Chez Maximillia was wonderful! The house was immaculate, super clean, and very tastefully decorated. Everything we could possibly need was at our disposal, and there was no shortage of great offerings to take advantage of! From the hot tub, board games, and movie selection, to the game room with the ping pong, air hockey, and foosball tables. This home is perfect for any demographic, whether it’s a family looking for an adventure, a group of friends who want to get together and enjoy each other’s company, right down to the couple looking for a romantic getaway. The communication with the owner was easy, and everything you needed to know about the house is at your fingertips upon your arrival. Chez Maximillia comes highly recommended! Great Weekend Getaway in Cozy and Elegant Cabin! Awesome cozy cabin. It's right on the river with a great loft for the kids. We had a few questions with the hot tub, but the owner was super quick to respond and solve the problem. Great weekend! My family and I really enjoyed our stay! It had plenty of entertainment for the kids (Ping Pong, Air Hockey, and foosball). It was very clean and more than accommodating for my entire family. I would definitely recommend this place.